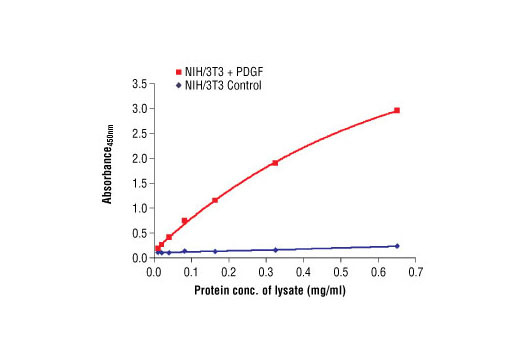 The relationship between lysate protein concentration from untreated and PDGF-treated NIH/3T3 cells and the absorbance at 450 nm using PathScan® Phospho-Akt (Thr308) Sandwich ELISA Antibody Pair #7144 is shown. After overnight starvation, NIH/3T3 cells were treated with PDGF (50 ng/ml) for 10 minutes at 37ºC and then lysed. CST's PathScan® Phospho-Akt (Thr308) Sandwich ELISA Antibody Pair is offered as an economical alternative to our PathScan® Phospho-Akt (Thr308) Sandwich ELISA Kit #7252. Capture and Detection Antibodies (100X stocks) and HRP-Conjugated Secondary Antibody (1000X stock) are supplied. Sufficient reagents are supplied for 4 x 96 well ELISAs. The Akt Rabbit Capture Antibody is coated in PBS overnight in a 96 well microplate. After blocking, cell lysates are added, followed by Phospho-Akt (Thr308) Mouse Detection Antibody and HRP-conjugated Anti-Mouse IgG. HRP substrate, TMB, is added for color development. The magnitude of the absorbance for this developed color is proportional to the quantity of phospho-Akt (Thr308) protein. Custom Ordering Details: Product is assembled upon order to ensure maximum activity. United States: Please allow up to two weeks for your order to be processed and shipped. Outside of the United States: Please allow up to three weeks, depending on the country, for your order to be processed and shipped. When ordering five or more kits, please contact us for processing time and pricing at sales@cellsignal.com.